Photons are those little bundles of energy that we call light. This is very important in photography, so that was the subject of my blog on Tuesday. You might like to read that or look at the pictures even. Supplies of some veggies are short in the UK, because of the rain and so I wrote a bit about that on Thursday. You might like to read that before you open a bag of frozen peas. We all need to be thrifty these days and shop around. Friday the 13th | Unlucky? I don’t have a subject for tomorrow’s blog, so if you have a question do comment and ask it. I usually just ramble through anything while lunch is cooking on a Sunday. I wrote a few blogs for a Zillion Ideas too this week so do pop over there and read those. You can also comment and tick the box to subscribe to either website. If you subscribe (follow) you get an email every time there is a new blog (just about every day). If you fancy writing a blog yourself or learning about how to blog, then have a go at it. Write a blog about something you know about, send it to me at the address in the sidebar and if it’s any use, I’ll publish it on a Zillion Ideas. I’ll also advise on getting a WordPress blog and how to set it up, if you want to have your own blog. It is a good idea to start with guest blogs though. If you want to make money from blogging, that is a little more difficult; but again, I can advise. This entry was posted on 14, July 2012 by Mike10613. It was filed under Blogging, Ramblings and was tagged with lottery, luck, Neodigital Art, Photon, Social animals, supply and demand, Thrifty, transatlantic ideas, Vegetable prices, WordPress, Zillion ideas. Love this photo! When you take a photo, do you already know how you will edit it or do you use the trial and error approach? I had a vague idea with this one. I thought the black and white fence might look good in monochrome. I did one once before and the trees looked good. 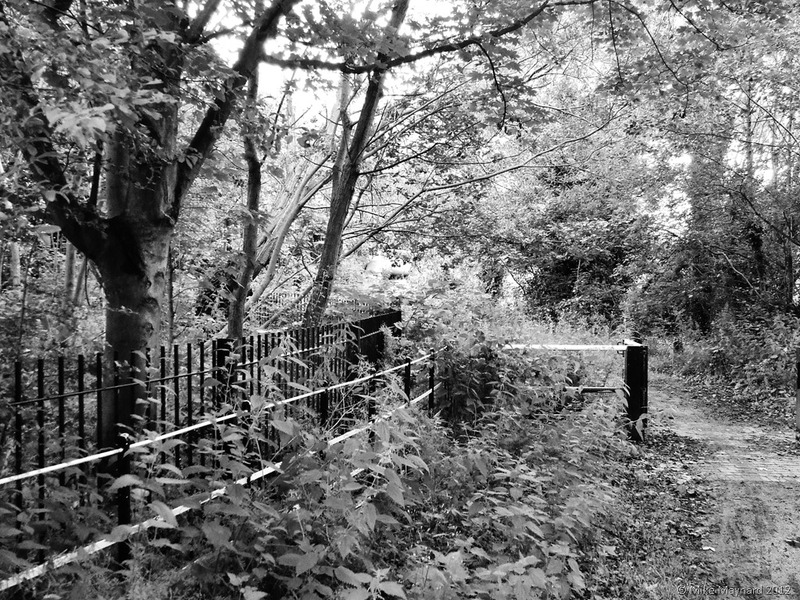 I took lots of shots of the gate and then tried this one in monochrome. I might try some of the other photos in different colours. It is partly trial and error. I found some information on the history of that site today and the pools filled up again in 1999; so I’ll have to check what they are like now. I think some work might have been draining them, but that’s nearly finished. The site used to be prone to flooding! There is a 30ft wide seam of coal beneath the woodland but they couldn’t mine it because of flooding. We’ve had record rainfall and so it has to be going somewhere! My window cleaner is also my gardener, so he is really pissed off.